Collectors Edition - t800 skynet. Case chrome shell "head of t-800" with flashing eye and sound chip limited to 1000 copies. The blu-ray disc presents 3 versions of the film: - the cinema version (137 ') - the director's cut version (154'- the additional scenes are in vost only) - the director's cut version long (access by the code "82997" 156'- the additional scenes are in vost only) d-box motion code (specific signal for synchronized vibration system) thx optimizer (version 2.0). 26 actors and members of the film crew (recorded in 1993). James Cameron and William Wisher (recorded in 2003). Interactive modes ("pip" display during movie playback, only on director's cut version). "visual implants": 69 video modules of making of (vost - 40'47). "Infos & anecdotes module" (vo). "connected interactive modules": 59 commented image modules (vost - 104'06). "source code": display of the scenario (vo). Quiz mode: test your knowledge of the film (50 questions - see below). "tests - processor": 17 mini games (vf). Teaser: "building the perfect arnold" (1'24). Trailer 1: "this time there are two" (1'47). Trailer 2: "same make, new mission" (2'07). Director's cut trailer: "more than meet the eye" (2'07). Trailer t2 thx director 's cut (dts-hd ma 5.1 - 47). "The Search for the T-1000" with audio commentary subtitled by Robert Patrick and James Cameron (1'27). "The Sequence of the Future" with subtitled audio commentary by Stan Winston, Linda Hamilton and James Cameron (1'48 - Vost). "the dyson register": credits of this blu-ray edition. Skynet access (additional bonuses accessible via bd-live). The free shipping is only valid on the simple letter, not including bubbles protection, nor any form of follow-up, no claim is possible in case of loss or deterioration Opting for monitoring is getting more security, protection, but also to receive treatment and priority shipment while having traceability! Attention, in case of purchase of several objects in sending benefiting from free, your order can be shipped in global relay (the relay point closest to your home will be determined by me) if the sending letter does not allow incorporate the entire order (weight or size too important). The group delivery will be in global relay (relay point) for Belgium, Luxembourg, Spain, Germany, Italy, Portugal, United Kingdom, Austria. Please, contact me before, you must have a dvd reader wich can read dvd of region 2 / for blu ray you should have a blu ray reader wich can read blu ray of region b. Terms of Sale: Any item purchased must be paid within 7 days or a dispute for non-payment will be opened automatically. Please be sure of your purchase when you make it. For any questions about the subject or another subject, thank you to contact me before buying the object. I can not be held responsible in case of loss or damage during the delivery, you will have to turn against the carrier (laposte). Returns are accepted when the object returned to me in its initial condition (nine) and this return will be at your expense; the refund of the returned item will include a deduction (packaging + logistics). Once you buy an item, you agree to these terms. Any claim relating to a subject mentioned in these conditions of sale, will not therefore see any further action. I leave myself 5 working days to deposit the package. If you encounter a problem, please contact us before issuing an assessment or a dispute, in which case we will be able to find a solution. If you decide to make an assessment before trying to resolve the concern, no commercial gesture will be accepted. What does "opportunity" mean: it is an object that no longer has its original blister, so it can have traces of time, however this does not mean that the object has a defect. It is in perfect working order. What does "nine blister" mean: as the sentence indicates, the object is still in its original packaging, so it can not be defective. If the ad has an error description problem, photo does not match, etc. , do not hesitate to let me know to improve your comfort of purchase! Notice to fans, do not play dishonesty! Profile (0) or negative, please contact me before bidding, thank you! 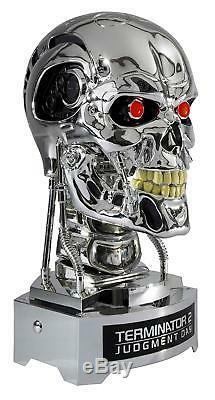 The item "blu ray terminator 2 skynet t800 ed French rare" is on sale since Tuesday, September 25, 2018. It is in the category "dvd, cinema \ dvd, blu-ray". The seller is "o_avengers_o" and is located in my home. This item can be delivered anywhere in the world.